As part of the 400 series, LTD’s EC-401 is built to last and perform for even the most demanding professional musician, and features EMG 81/60 active pickups. The EC-401 is ready to handle any kind of music where guitar gets pushed to the forefront. It has a set-neck design for comfortable, fast access to the higher frets, and a mahogany body, 3 pc. mahogany neck, and rosewood fingerboard. It also includes high-quality Grover tuners, and is available in three great finishes: Black, Olympic White, and Military Green Satin. Once again, LTD does the impossible. The H101FM is an entry-level price point, but its performance is anything but entry-level. 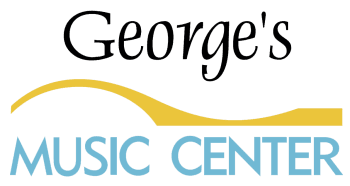 George's Music Center is proud to offer you this incredible instrument!! The 5-string bass you always wanted but never thought you could afford is right here. The B-5E offers neck-thru-body construction along with a beautiful ebony wood top over its mahogany body. Great for nearly any style of music, the B-4E has a fast and comfortable extra thin U-shaped 5-piece maple/mahogany neck, black nickel hardware, and includes ESP Designed SB-5 pickups with an active 3-band ABQ-3 ES. Available in Natural Satin finish. Also available as a 4-string with the B-4E. Guitars in the LTD EC-1000 Series are designed to offer the tone, feel, looks, and quality that working professional musicians need in an instrument, along with the pricing that typical musicians can still afford. Available in Snow White finish, the EC-1000T/CTM delivers the complete look and feel of a traditional thick-bodied, single-cutaway rock guitar. It offers set-neck construction with a mahogany body, 3 pc. mahogany neck, and 22-fret ebony fingerboard, multi-ply body/neck/headstock binding on body top and back, and includes LTD locking tuners, a Tonepros locking TOM bridge and tailpiece, and the great 1-2 aggressive punch of active EMG 81/60 pickups. Guitars in the LTD EC-1000 Series are designed to offer the tone, feel, looks, and quality that working professional musicians need in an instrument, along with the pricing that typical musicians can still afford. The EC-1000QM offers the sumptuous look of a quilted maple top along with the classy LTD Deluxe features that set it apart from other guitars in its range, such as abalone inlays and purfling, full body/neck/headstock binding, and premier components like LTD locking tuners, a Tonepros locking TOM bridge and tailpiece, and the aggressive punch of active EMG 81/60 pickups. It also offers set-neck construction with a mahogany body, 3 pc. mahogany neck, and 24-fret rosewood fingerboard. Available in See Thru Black Cherry finish.